Coming from the kitchen this week is a unique dish that doesn't grace our menu too often. 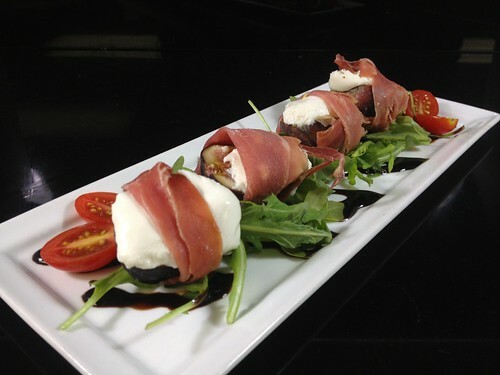 We are currently serving burrata mozzarella and figs wrapped in thinly sliced prosciutto. Saturday night we introduced this item to our customers as a special, and by Monday morning we were completely sold out of it. Burrata, meaning butter, is a fresh Italian cheese made from mozzarella and fresh cream that has a buttery taste as its name would imply. It is typically served at room temperature with an outer shell of solid mozzarella, while the inside contains a smooth combination of mozzarella and cream. The cheese and fig combo are then wrapped in thinly sliced prosciutto which is a slightly salty, dry-cured Italian style ham. This sweet and savory appetizer is served on a bed of fresh arugula with a balsamic cream dressing. This dish is a delicate balance that covers a wide range of taste palates... and while we're sure you'll love it, we can't guarantee it will be around for long! Stop in soon before this dish skips town again!